Trinbago Knight Riders put the disappointment of their Hero Caribbean Premier League (CPL) Playoff 1 defeat to Guyana Amazon Warriors behind them with a professional 20-run semi-final win over St Kitts & Nevis Patriots. Not for the first time, the Knight Riders spinners were key to their success as both Sunil Narine and Fawad Ahmed proved almost impossible to get away, while even part-timer Colin Ingram made a telling contribution with the hugely important wicket of Devon Thomas, who had single-handedly put the Patriots in a strong early position with 35 of the 44 runs made before he was the second wicket to fall after seven overs. The first went to Ali Khan, a revelation with the new ball this season, who finished off a stunning opening over with a perfect delivery to find Chris Gayle’s outside edge and send the big man back to the pavilion without scoring. Narine and Fawad got the wickets their efforts deserved when Rassie van der Dussen chipped a return catch to Narine off a leading edge and Evin Lewis sent a slog-sweep off Fawad steepling high into the Trinidad sky to be well caught on the run by Colin Munro when it finally came back down. Brandon King made a quick-fire 33 from 22 but when he became Narine’s second victim, bowled attempting to clear midwicket, the writing was on the wall. Ali Khan returned to ramp up the pressure, giving up just six singles in the 15th over as the required rate climbed to 14. That pressure told in the next over as Anton Devcich gave Fawad the charge and ran past a googly that spun beyond his flashing blade to hand Denesh Ramdin a straightforward stumping before Ben Cutting was trapped lbw on the sweep as Fawad ended with 3/13 from four near faultless overs. 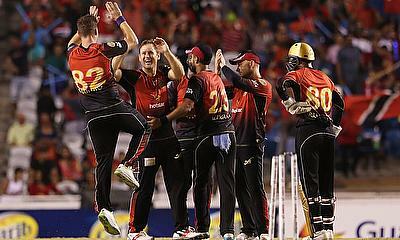 The target had now reached 65 from just four overs for the Patriots, and despite the best efforts of Fabian Allen (32* off 19) and Carlos Brathwaite (16 from 14) in a defiant 45-run partnership, some quality death bowling from Ali Khan, Dwayne Bravo and Kevon Cooper saw the Knight Riders home with something to spare. After being put in to bat, the Knight Riders were indebted to the impetus provided by Brendon McCullum in the first half of the innings and Dwayne Bravo in the second as they put 165/6 on the board. New Zealand legend McCullum was initially watchful as he assessed conditions at the Brian Lara Academy, reaching just 10 from 13 balls in the Power Play before exploding into life. He hit three Hero Maximums as he hammered 33 from his next 12 balls before misjudging a full delivery from Chris Gayle to be trapped plumb lbw. Colin Munro made a steady 29 to take his season tally to 499, while Ramdin added 27 not out from 25 at the end of the innings. But Dwayne Bravo was the man responsible for lifting the score beyond 160 as he continued his remarkable hitting form in this season’s Hero CPL. Tabraiz Shamsi had conceded just 18 runs from three overs before running into Bravo, who smashed three sixes from the left-arm wrist-spinner’s final over. Sheldon Cottrell also saw his figures slightly spoiled in his final over as the Knight Riders plundered a decisive 47 from the last three overs. 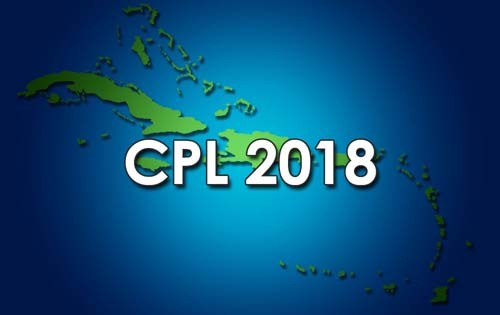 Cottrell had taken 2/10 from three impeccable overs, having Colin Ingram caught at third-man with the new ball and removing key six-hitter Darren Bravo caught at point in his comeback over at the death. But 15 came from his final over, with much of the damage self-inflicted as a wide down the leg-side flew away to the boundary. Eleven more came from the final over to complete the Knight Riders’ late flourish that ultimately put the total beyond the Patriots. Upcoming Fixtures: Sunday 16 September – Final: Guyana Amazon Warriors v Trinbago Knight Riders (5pm), Brian Lara Stadium. Warriors book Final place after edging Knight Riders in thriller!